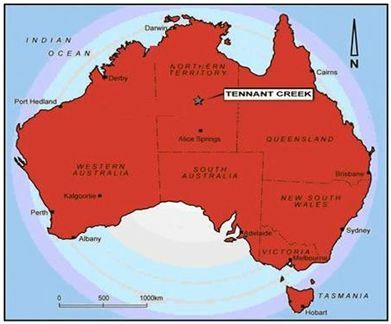 The Tennant Creek projects (Figure 1) are all within 25km's of the regional gold mining centre of Tennant Creek, in the Northern Territory. The infrastructure associated with the Tennant Creek Township is currently under utilised. A services corridor including road, rail and a gas pipeline exists between shipping locations at Darwin and Tennant Creek. The projects were acquired based on regional structural analysis, evaluation of historical major mines and mineral occurrences. 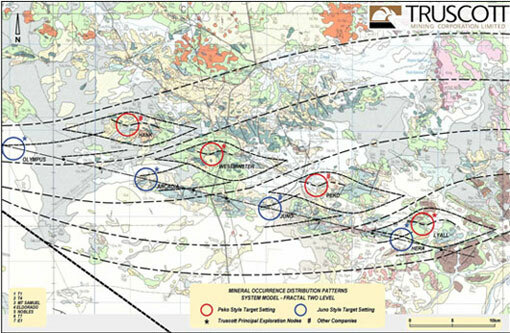 The Directors consider the Tennant Creek projects to be highly prospective for precious, base and specialty metals. It is expected gold will be the major economic driver for the projects, with significant credits from other metals. The application of the company's structural modelling has enabled the identification of eight primary nodes that exhibit similar geological settings to the historical major deposits identified (Figure 2). Of the eight interpreted principal nodes, Truscott holds 100% tenure over Westminster, Lyall, Hera, Olympus, and Arcadia.